"The warmer season will come (believe it), and wool just won’t cut it: you’ll want a lighter-weight material to cover up in. Enter our range of cotton and linen unstructured jackets: timeless pattern, marvellous lightness and the warm weather-ready look we long for all year." "Lightweight, unstructured jackets in classic patterns made from cotton or cotton-and-linen blends – perfect to finish a sunny daytime look." I've been on the look out for a slim fit seersucker jacket all summer long, and could not find one that fit just right. 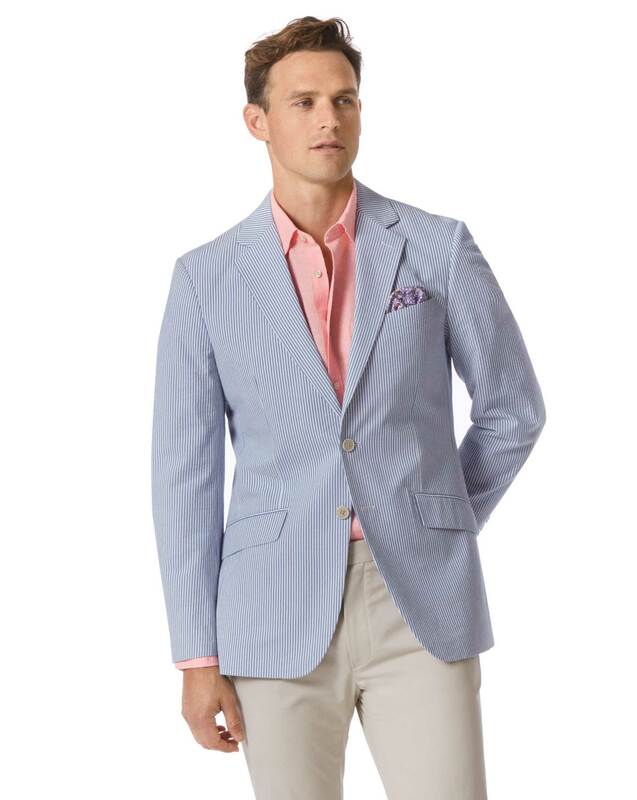 Until now... this jacket from Charles Tyrwhitt just simply checks off so many boxes for my meticulous OCD: it's beautiful, form fitting (no alterations required), modern with dual vents, yet maintaining it's classic look and feel, working surgeon buttons, etc, etc. Suffice it to say, I am extremely happy with my purchase, and look forward to wearing this jacket for many years to come for the summer. Bought this item for a graduation event!